A number is formed by grouping the digits together. ● Each digit has a fixed position called its place. ● Each digit has a value depending on its place called the place value of the digit. 1. The place value of every one-digit number is the same as and equal to its face value. (i) Place value and face value of 1, 2, 3, 4, 5, 6, 7, 8 and 9 are 1, 2, 3, 4, 5, 6, 7, 8 and 9 respectively. (ii) The place value of zero (0) is always 0. It may hold any place in a number, its value is always 0. As, in 105, 350, 42017, 90218 the place value of 0 in each number is 0. 2. In a two-digit number, the place value of the ten-place digit is 10 times of the digit. As, in 58, the place value of 5 is 5 × 10 = 50 and place value of 8 is 8 × 1= 8; the face value of 5 is 5 and of 8 is 8. 3. In the number 475, the digit 5 is at one’s place, digit 7 is at ten’s place and digit 4 is at hundred’s place. So, place value of 5 = 5, place value of 7 = 7 × 10 = 70, and place value of 4 is 4 × 100 = 400. Thus, for the place value of a digit, the digit is multiplied by the place value of 1 it has to be that place. the place value of 7 is 7 × 100 = 700. 4. Now it is the general law that the digit possesses its place value as the product of the digit and place value of one to be at that position. 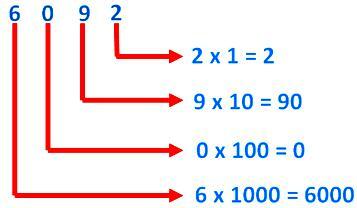 the place value of 9 is 9 × 1 = 9 as 9 is at one’s or unit’s place. the place value of 2 is 2 × 10 = 20 as 2 is at ten’s place. 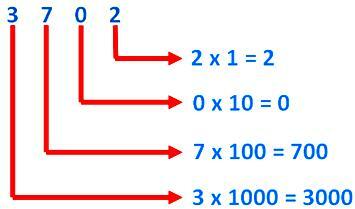 the place value of 1 is 1 × 100 = 100 as 1 is at hundred’s place. the place value of 4 is 4 × 1000 = 4000 as 4 is at thousand’s place. (iv) Here, we also see that the place value of the digit 0 in a number is always zero, whatever may be its position.